Can you teach English in Asia without a degree? Without TEFL certification? If you are not a native English speaker? Over the years I have met many English teachers without certifications, degrees or other qualifications. Teaching without a degree is possible, but there are limitations. Teaching English in Asia without a degree can be illegal. I know there are people out there that will say that "IT IS ILLEGAL!". Which isn't exactly right. It's illegal to teach if you don't have the proper visa. Normally to get a visa to teach English you need to have a degree, but soon I'll tell you some other kind of visas which can enable to teach legally. And I am going to tell it like it is. Some people have a sort of stigma about teaching without a degree. I don't, because you're not harming anybody and usually having a degree doesn't make you any more qualified than the person who doesn't unless of course it was a teaching related degree. At some point or another most teachers abroad have actually taught "illegally". If you ever taught privates then that is usually illegal. Your visa that you needed that degree to get is for teaching at that school not others or privately. If you worked for another school without a visa then it was probably illegal. If you spent anywhere from a couple days to a month working on a tourist visa without completed documents while waiting for your visa to come through then that was illegal. And I actually I don't care about this and have done all of the above like the majority of teachers out there in Asia. There's snobbery out there and sometimes that snobbery comes with a bachelor's, some certificates, master's or even a teaching degree. I don't think I am better because I have a degree and you don't. It doesn't usually mean I am any better of a teacher either as most teachers out there have a degree in an unrelated field. But if you ever go to the forums like Reddit r/tefl then you are going to get some resistance. They made some thread saying that they would ban anyone if they told someone how to teach without a degree. It all sounded a little too extreme for me. And no they didn't ban me you can still see ESLinsider on Reddit, but I kinda lost interest in that forum. You're a grown adult and you can make your own decisions. Can you teach English in Asia without a degree? A lot of things are possible and this is too. You can teach English in China without a degree and it was probably the easiest place to do this. You can teach English in Korea without a degree. You can also teach English in Taiwan without a degree. You can even teach English in Japan without a degree. But now that I said that you should know that you usually need a degree and to be a native English speaker to get a "legal work visa" for teaching English. There are other ways to sort your visa which I'll tell you later, but there are often limitations and risks which I'll tell you about later. What kind of jobs will be available? If you are teaching illegally those will be mostly part time, temporary or possibly tutoring positions. So to make a living you may have to get a few jobs. It depends on the country, but you should know that even having an official work visa doesn't necessarily grant you permission to work part time at another school. Most part time jobs cannot provide a visa to begin with, so these make ideal opportunities. Occasionally there may be full time jobs as well. But you should know that they would probably only be offering you that position if they didn't have the ability to get the legal work visa. You can search for private lessons. To find students you can place ads online, make a business card and get out there and be social. One of the first things you are going to have to work out is your visa. There are a lot of different kinds of visas depending on your situation and the country. There are working holiday visas, student visas, business visas, foreign national visas, spouse visas and more. Working holiday visas, student visas, foreign national visas, and spouse visas usually permit you to teach at least part time. Granted you have a good reason (don't say teaching ESL) you can normally leave the country and return and get another month, two or three depending on the country. From a financial perspective it's not really a good idea since every few months or so you're going to have to drop several hundred dollars on getting a round trip ticket out of the country. If you do it on a tourist visa for Taiwan your goal is to get a 2 or more month extendable multiple entry visa (a good way to enter even if you have a degree). With one of these they are usually good for a year and you can leave every few months and then return. They are not always easy to get and you'll have to apply for it and pay some money. You get 3 months in Japan and Korea. So after three months you can renew it by going to the other country by boat or plane and returning. Upon returning you'll get another 3 months. In China, a tourist visa - which you have to apply for is only good for one month (some you can renew one time by leaving and returning) and for Americans it's around $140-150. As far as I know citizens of other countries may only pay 160 Yuan ($26). When applying for a tourist visa in Taiwan and China you may be asked to show a bank statement to prove that you have plenty of money. Study Chinese, Japanese, or Korea at a school for the minimum amount and you can get a student visa. Sign up for classes at a language center or university in the country of your choice that will offer a visa. These can last as long as a year or as long as your studies. In some cases you can get one of these for only studying a few hours a day. This will maximize your freedom. I met many teachers in Taiwan who got their visa by taking Chinese lessons. A spouse visa may also grant you permission to legally teach in Asia, like for example in Japan. But like you may have gathered already you'll need a spouse. That is you'll need to be married to a Japanese citizen or a citizen of the country where you are planning on teaching/living. Out of China, Korea, Taiwan and Japan, China is one of the best places to teach abroad without a degree. It may be the only place where you might find a school/company that could give you a visa to teach. However, it is still usually illegal. The visa that they will likely give you is called an F visa. These are business visas not teaching visas. They're usually good for 6 months. You need a Z visa to teach English legally in China. From what I have learned each province in China may also have slightly different requirements to teach English in China with tier 1 cities being the strictest. And if you get lucky you might be able to find a school with connections to the government that could issue you a Z visa. But don't count on it. In Japan, for example you'd be able to get a working holiday visa if you are a native English speaker and from a common wealth country. In some cases if you have one of these then you may be able to find work teaching. But it's a pretty competitive market and you'll be up against teachers who have experience and degrees. Basically if you are looking for security you may be out of luck. No one is going to pay up front for you to fly to the above mentioned locations. You'll have to be there to find work. You may be able to find a job in China from outside of China if you don't have a degree and you are not picky. In China it may be possible to a find a position that will also reimburse your airfare after one year of contracted work. These jobs usually come with an F visa. Maybe around the start of the new year in China and around August. Some private companies place teachers in public schools there. I knew of a couple teachers working in Shanghai through one of these companies and they didn't have degrees or certification. In the other places I would say it doesn't matter as most jobs available to you will be through private academies. They hire throughout the year. There are also many spring and summer camps for a month or so. So what's the RISK with teaching English illegally? The risk is that you could get caught and kicked out of the country and/or possibly have to pay a fine. You may not be allowed back into the country for a period of time as well. They can also mark it in your passport with a "DEPORTED" stamp. This won't look good and could cause you problems when you enter other countries. The immigration officials in those countries may question you. Do I have to be a native speaking English teacher? Usually, but I have met a few non-native English speaking teachers who were from Europe that were teaching in Taiwan. I think they may have been teaching illegally though. I have also met non-native European teachers (from Czech & Holland) in the course getting Z visas to legally teach in public schools in China. The other thing that I would say is that there are certain preferences. Many schools will prefer Caucasians. So if you don't fit the role - the one they have in mind, then you may be out of luck. Yes, it's possible to teach English there if you have 10 years of experience and you can prove it. I met someone online in the advanced course who was a non-native speaker possibly from Mexico if I remember correctly, but who was teaching legally on a humanities/specialist visa. I also met a German girl here in Fukuoka who was working in an eikaiwa as a German teacher, but primarily as an English teacher. She said the school never asked for proof. Maybe since she is from Germany they didn't care. Most Germans can speak English quite well. Can I teach English without a TEFL/TESOL/CELTA certificate? You can teach English in Asia without a TEFL/TESOL certificate most of the time. Getting some kind of certification would help you teach and make your resume look better especially if you do not have any qualifications. They do not replace degrees for visa purposes. In some instances they can be required to teach in China. If you have 2 years of your degree completed (or an associates) and a TEFL certificate in Taiwan then some schools may be able to issue you a visa to legally teach there. But they are not usually required to legally teach English in Asia. Also if you have 2 years completed of your degree you can legally teach English in Korea through the TALK program. Now you should be more informed about teaching English in Asia without a degree. 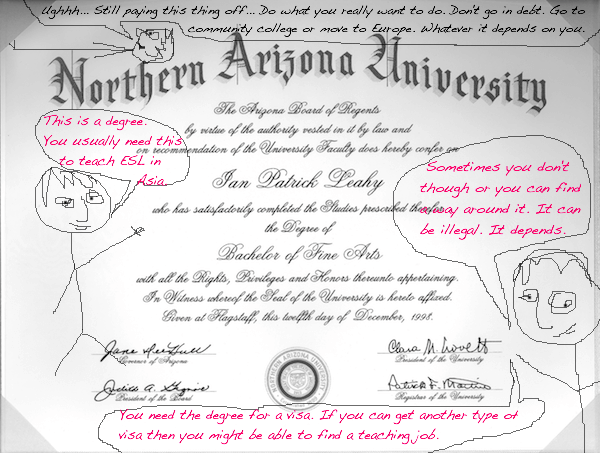 The degree is for your visa, but if you can get another kind of visa then it can be legal. If it is not legal then there are risks, but you are a grown adult and can make your own decisions.